Hover your mouse over a green star to see more about that attraction. All these attractions are within walking distance (at most 10 minutes) from our home (the red star). See more of our favorite attractions. Fantasy Fest. This week-long party simply must be experienced to be believed. Visit the official Fantasy Fest website. Scuba Diving. The keys are world famous for diving. Bring your Scuba gear and dive the challenging wrecks of Key Largo, the gorgeous easy reefs of Key West, or the newest Key West dive attraction, the USS Vandenburg. Just google "key west scuba diving" to get the websites of several local dive shops, or call me for recommendations. Mel Fisher Museum. See gold and silver recovered by Mel Fisher from the 1622 Spanish fleet. Mel Fisher website. Fort Zachary Taylor State Park. This great beach is a short walk from our place. Their website gives you more details. Water Sports. Our 23-year-old daughter recommends Fury's Ultimate Adventure for a great day of watersports. Sailing, snorkeling, parasail, jetski, kayak, all on one trip. Butterflies and more are found at the Key West Butterfly Conservatory on Duval St.
Key West Webcams. Watch Key West party with these webcams from around the island. Key West Webcams. More Tours and Activities. 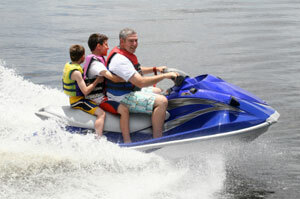 This website advertises many of the tours and activities you can find on the island. Best on Key West. Our home at 208 Southard St. This is a very fun tour. Lots of interesting stories about Hemmingway's life. Meet all the descendants of Hemmingway's original 6-toed cats. 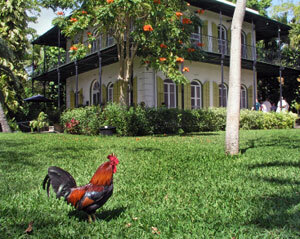 And you've got to love the roosters that roam free all over the island, providing their free wake-up service. 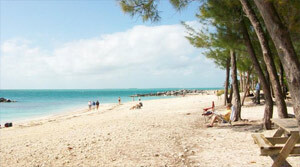 Key West has several good beaches, the largest being Smathers Beach along the south shore. But we love the intimate beach at Ft. Zachary Taylor Park, on the west end of the island. Ft. Zach is about a 12 minute walk from our home. 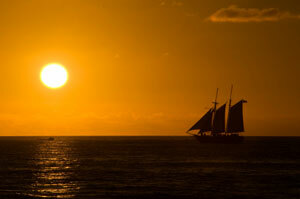 Key West's famous sunset celebration happens each night at Mallory Square. Come for food, shopping and the street performers, and stay to cheer the sunset. 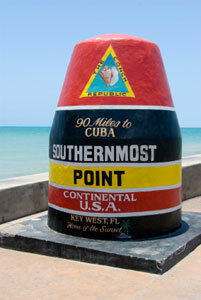 Closer to Havana than we are to Miami, Key West is the southernmost point in the continental U.S.
A great place to have a cold one or three while the sun sets. 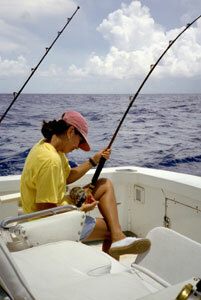 Key West is one of the best places in the U.S. for big game fishing. Or just do what we do, and spend a relaxing day on the water pretending to fish while the crew does all the work. Rent a jet ski, go parasailing, take a cruise to the Dry Tortugas, or join one of the many sailing or powered cruises around the island. 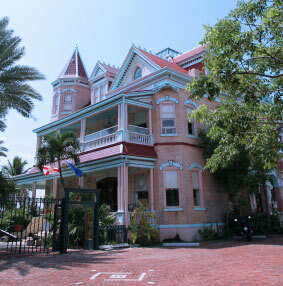 Old Town Key West is renowned for it's historic local architecture. 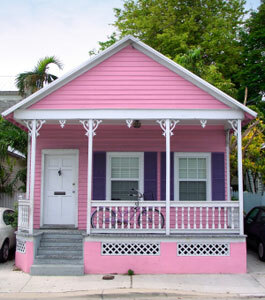 You'll find plenty of "conch cottages" all the way to glorious victorian homes. Just walk around and explore. One of the many glorious Key West homes. 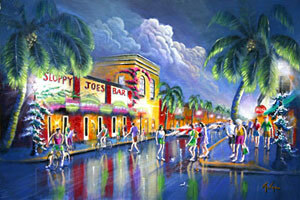 Night or day, if you can't find a party on northern Duval Street, then you must already be passed out! Home to legendary bars like Sloppy Joes, Hogs Breath, and many others. 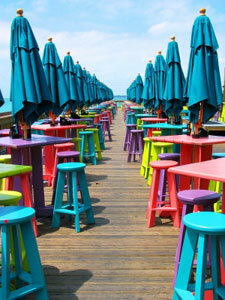 You'll also find a great selection of reasonably-priced restaurants. The southern end of Duval street is much quieter than the party end to the north. Lined with art galleries, shops, and restaurants, it's a great place for an afternoon or evening stroll. And don't forget to visit the Butterfly museum!